We're Definitely Not In Kansas Anymore! In the year 2060, eight year old Dorothy Gale and here genetically enhanced dog, Talk-Talk, are mysteriously swept off the planet New Kansas and Talk-Talk find themselves in a strange, new Galaxy, far from home. The wonderful, magical GALAXY OF OZ! Dorothy's arrival could not have come at a better time! An evil witch named Gloomhilda once ruled the magical Galaxy through fear and terror. The good Dr. Oz used science to drive her out. Now, Gloomhilda has amassed an army on the outskirts of the GALAXY and is preparing to win back her empire. Thanks to Dorothy's unexpected arrival, Gloomhilda's sneak attack fails. However, the wise and learned man, Dr. Oz knows Gloomhilda will return and he also knows that next time they might not be so lucky! The Wizard of Oz has a plan which will free the GALAXY of the wickedness of Gloomhilda for all time. Legend tells of three magical Crystals, the Crystal of LOVE, the Crystal of WISDOM, and the Crystal of COURAGE. These magic Crystals were spread throughout the GALAXY and lost hundreds of years ago. According to the legend, whoever possesses all three Crystals will rule the GALAXY OF OZ for all Eternity! Under the guidance of Dr. Oz, Dorothy and the most unlikely assortment of "heroes" you've ever met, set out to scour the GALAXY in search of the Three Magical Crystals. Unfortunately, Gloomhilda also knows of the ancient legend. She and her evil Skeezers will stop at nothing to possess the magical Crystals and regain her lost kingdom! 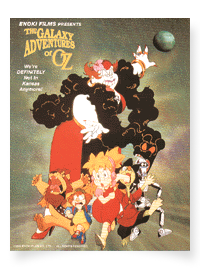 THE GALAXY ADVENTURES OF OZ is a race between good and evil, between science and sorcery! The stakes are enormous, the danger and adventure non-stop!